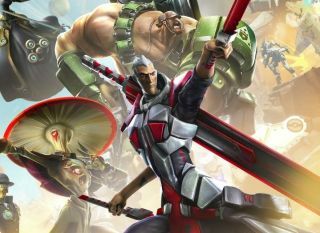 Battleborn's colourful heroes will commence murdering each other on February 9 2016, according to the release date at the end of this Gamescom Battleborn trailer. We took a look at the game a couple of months ago, and found that while it owes a clear debt to Borderlands, Battleborn could be ideal if you want to play with Borderland's crazy weapons, but don't want to spend hours finding them in chests. There's a competitive mode of course, but you can also tackle story mode alone or in co-op. There's loot, and a very Borderlands-looking skill tree, but a lot more ability variety thanks to the cast of 25 heroes. We get to see quite a few of them in this video, including the walking mushroom Miko and the owl-raising robot butler Marquis. I think I'll go for Phoebe, who uses telekinesis to wield her swords. I like her style.